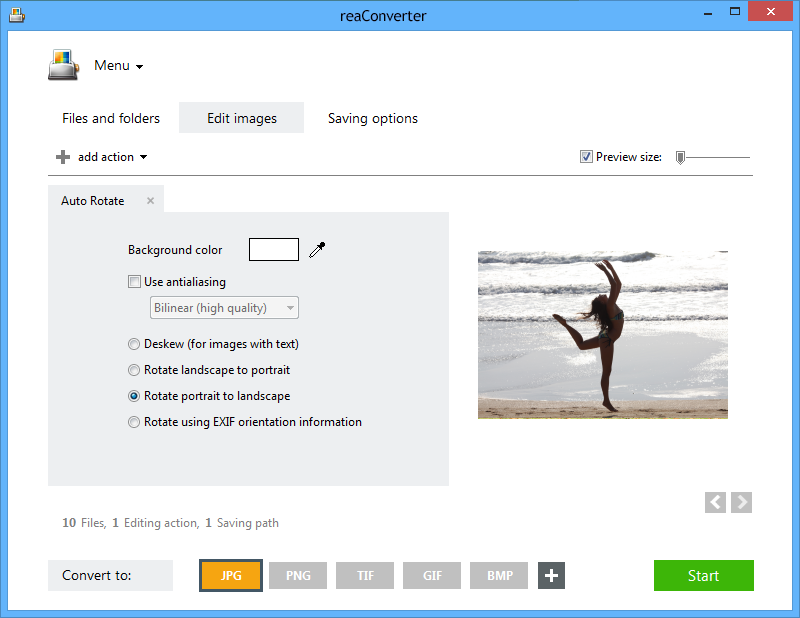 If you want to do more than just a clockwise or counter-clockwise turn when it comes to rotating images, reaConverter's Auto Rotate feature is what you are looking for. This advanced feature not only allows you to change an image from a portrait to a landscape position, but also to deskew an image with text and to rotate using EXIF information. Not to mention it's really easy and fast to operate! 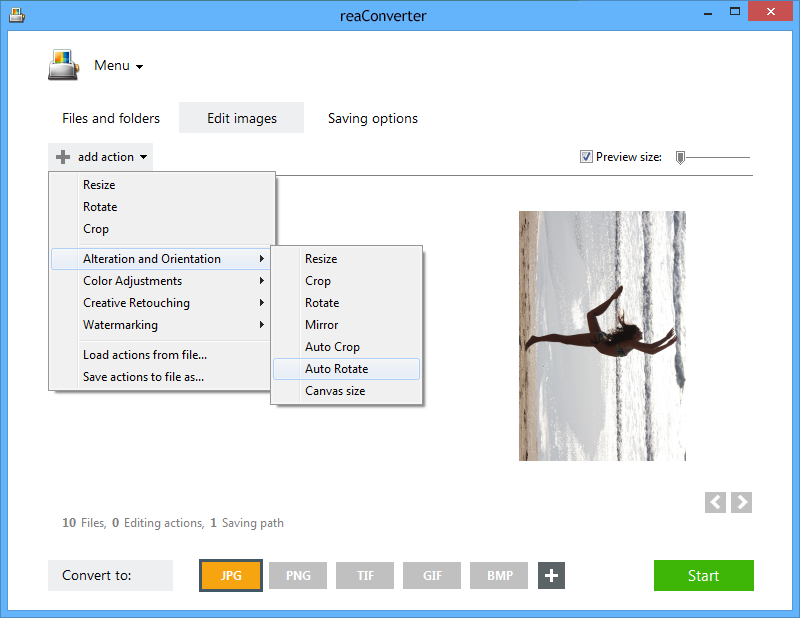 Open the image files you intend to rotate by pressing the Add files button. You can select them from your computer one by one, add entire folders or use the drag-and-drop tool. In the Edit images tab, go to the Add action button, and then to Alteration and Orientation. Here pick Auto Rotate. You will now be able to select from several options available in connection to rotating your image, such as using an Antialiasing device to avoid image distorsions, deskew an image with text in case its lines are misaligned, rotate landscape to portrait or vice-versa. 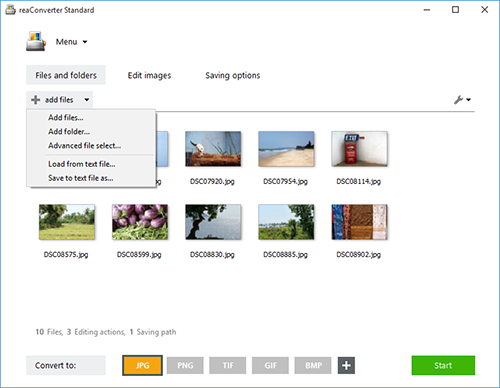 An additional option lets you rotate the image using the EXIF (Exchangeable Image File Format) orientation information embedded in the image file. Pick a Saving options from the large array offered by reaConverter. You can choose to save your new image files online, offline or in a customized location. Last but not least, decide if you want to preserve the input image extension or convert to a new one by simply clicking the extension buttons placed at the bottom of the window. Click Start and your newly rotated images will soon be available. where "al", "ah", "am" mean antialiasing low quality, high quality, maximum quality. Command-line auto rotating tool is an advanced feature meant for professional use, and is available in Pro edition only.